1 + 5 = ? : (Required) Please type in the correct answer to the math question. 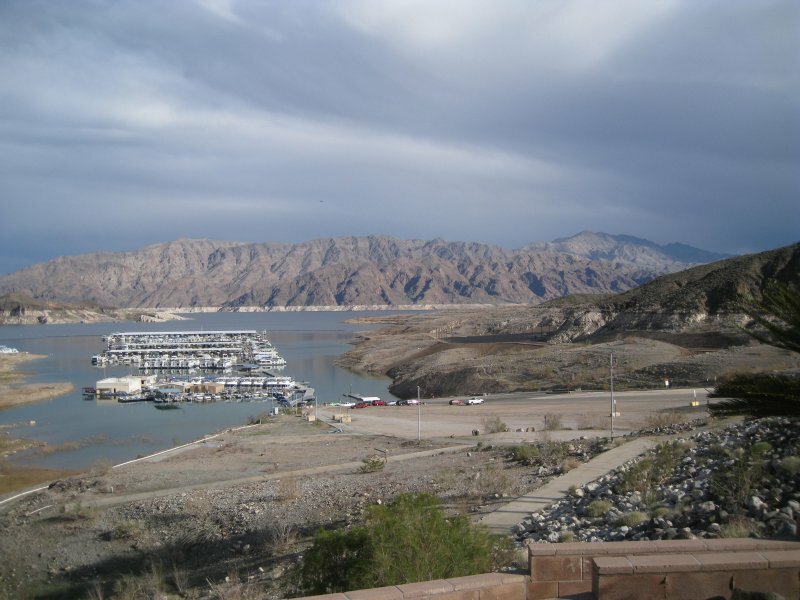 We left the glitz 30 miles behind as we drove south west out into the desert to the campsite at Callville Bay Marina on Lake Mead. This lake was formed by the damming of the Colorado River in 1936. Before that time and before the railroads steamboats came upstream to the Mormon town of Callville. It was tough going in the rapids where the boats had to be winched upstream via hooks cemented in the rocks. This marina (see photo) is mostly rental houseboats. It has an enormous boat ramp and parking lot. The length of the boat ramp is made necessary by the extreme variations in the water level. Launching your boat is a major undertaking with long walks up and down the ramp. The season here runs from May to September. Today the park was virtually deserted. There is a good weather window through Flagstaff, AZ on Friday with no snow or freezing weather during the day so we will be leaving the Lake Mead area then.